Docteure en histoire de l’art et critique d’art, Vanessa Morisset s’intéresse à peu près à tout, suivant un programme inspiré du « sortir de la philosophie par la philosophie » de Gilles Deleuze transposé à l’art. En tant qu’historienne, elle travaille sur les relations entre l’art et les autres domaines, notamment à travers les liens high and low entre art et culture populaire. Sa thèse portait sur Mimmo Rotella et ses décollages d’affiches de cinéma – westerns, péplums, films fantastiques et d’horreur – à Rome, autour de 1960. Critique d’art, elle collabore régulièrement à 02, Esse et Possible (membre du comité rédactionnelle), puis écrit avec et pour des artistes. Mais une réflexion mêlée d’amour fou pour l’écriture la conduit aussi à d’autres productions textuelles plus expérimentales, avec en tête la belle idée de Michel Leiris « c’est par la subjectivité (portée à son paroxysme) qu’on touche à l’objectivité ». Ancien étudiant à l’ESAD de Reims, Yohann Simonnot est diplômé en 2017 du DNSEP en Design Objet et Espace avec les Félicitations du Jury. Il a rejoint la pépinière Design’R où il est designer free lance. A l’ESAD, il est responsable de l’atelier de prototypage rapide. Originaire du sud du Pays de Galles, Paul Roberts est diplômé en économie, politique et sciences sociales de l’Université de Manchester où il se passionne pour la musique et le cinéma. Après avoir travaillé en tant que chef de projet dans une maison d’édition à Londres, il a déménagé en France et a enseigné l’anglais pendant 15 ans dans les secteurs de l’industriel, du médical et médico- universitaire. À l’ESAD, il enseigne l’anglais en 1er cycle. Vit et travaille à Paris. Diplômé des Beaux Arts de Montpellier en 2005, Mark Geffriaud a exposé depuis en France et à l’étranger : au Palais de Tokyo (2008), au Musée du Jeu de Paume (2011), au Plateau Frac Ile-de-France (2008, 2010-2013), au Centre Pompidou (2014), à la galerie gb agency (2009, 2011, 2015), au Mamco, Genève (2015), à Artist Space, New York (2009), et à David Robert Foundation, Londres (2009). À l’ESAD, il enseigne aux étudiants en option Art. The Art option aims to train the students for the creation of contemporary art. In order to do so, the student needs to have an intellectual curiosity, an openness to the world around them. The Art option allows the student to imagine an artistic problematic which is specific to him/her and allows him/her to define his/her place, and the place of art in society. In order for this to happen, he/she takes part in artist’s residencies and exhibitions from the second year on. The principal aims are artistic independence and collaborative practice. In the later years of schooling, teaching is backed up with research on structures of Social Innovation in Art, most notably in non institutional networks which are run by the people who have set them up. The permanent partners of the Art option are : Camac, the Centre d’Art Passages, the Vysocina in Czech Republic, the studio of Création Musicale Césaré, the association of Prisme sponsors, the Ecoles Supérieures d’Art du Grand Est. The option in Product-Space Design focuses on the creation of objects and how they are placed in a space by a creator with an authorship position. The process that is based around the user, the problematics of production, experiments with material, is also in part a result of the comprehension of the artistic issues that are at stake in design. The dialogue with crafts, the industrial problematics and its renewal are at the centre of these reflections. Two workshops with specific projects, in food design and in vegetal design, bring together students from different options and thereby address the question of the living in our environment. With a highly professional approach, the option includes research and development with business partners, with national and international competitions from the 2nd year of studies onwards. Every year, some projects are selected to be manufactured in limited editions, giving a unique visibility to the best students. The incubator and the business incubator of the ESAD are open to those who wish to set themselves up with an independent activity. The ESAD is cited by Interni, Italian press, as being in the top three of product design schools in France. The permanent partners of the Product Space- Design option are : the Chaire IDIS, the VIA, Bernard Chauveau editions, the Paris Design Week and D Days, the competitive hub Matéralia. The Graphic and Digital Design option gives priority to a form of creation that brings together visual, textual, aural medias, either traditional or digital. Its frontiers go from communication to drawing typographical designs. In the final years of the course, the teaching of graphics is directed towards problematics specific to mobile devices and digital interfaces. With a course that is highly geared towards professionalisation, from the 2nd year on, there are national or international competitions. From the 3rd year the issues that are related to digital aspects are worked on with partners, companies and engineering schools. The concepts in this way can be deployed right through up to the development stage. The permanent partners of the graphic and digital design option are Orange Lab, the Fondation Mines Télecom, the Institut Mines Telecom, the Centre International du Graphisme de Chaumont. This option brings living into the designer’s education, the daily aspect of it that is the most intimate, the most shared, and in this option, eating is treated as an art : installation, performance, visual arts are part of the food design option practised in the ESAD. But it is also a form of design, which touches on a powerful societal theme, which involves our future. Food design is interested therefore in the context and the valorisation of agricultural production, from the transformation by crafts and industry, to the different distribution channels, BtoB or public, in commercial spaces and in tasting, in restaurants or in the domestic context. An optional course during the first three years of the college in art or design, a master in specialised food design, and during the post graduate training, these different facets are developed in relation with the leaders of these branches, and in numerous partnerships, in the form of competitions, commissions, events. The aim of the years spent in the Master is to acquire a culture that is both cultural and practical : the universe of food and the practice of design. The permanent partners of the food design option are the Université François Rabelais de Tours, Ferrandi- Ecole de Gastronomie, the lycée Gustave Eiffel, the Centre International des Vins de Champagne. The ESAD has been a publisher since 2004 of many works dedicated to food design. Despite not being able to obtain a degree with this option, it informs the overall activity of the ESAD. Vegetal design brings to bear a practical reflection on the place of the plant and the vegetal in our daily lives (domestic, work, commercial, urban…) with, as a backdrop, the constantly evolving relation of man to nature. Confronting objects with other temporalities, submitting them to changes of weather and the rhythms of the seasons, can this bring them closer to the users’ daily life? The vegetal can be seen today as a product, because the scientific conception of plants and their mode of industrial production raises questions that are of a qualitative, aesthetic and human order. Vegetal design is above all a crossroad of skills, where lots of knowledge and know how comes together : life sciences, such as botanic science, biology, physiology and the production economy which takes into account the ecological situation. The disciplines of space (architecture, interior design, landscaping) are also concerned. And finally, all these projects depend on the know-how of the gardener! In this context the quality of the projects is intimately connected to the quality of encounters and external collaborations. The ESAD places the pedagogical value of the projects at the centre of its preoccupations, and is particularly demanding in relation to what is at stake from a cultural point of view in its collaborations. The permanent partners of vegetal design are the Centre of Excellence in Agro- Resources Industries, and Jardin Jardins (Parc des Tuileries). This full time higher education course is aimed at young designers, artists and researchers who wish to specialise themselves and food professionals who wish to develop a design approach. It is a year of practice and meeting others, built up with focused workshops, professional immersion, visits, and specialised theoretical contributions. This course comes from more than fifteen years experience in the ESAD Reims in this research domain, with its numerous partners both private and public, as well as a specialised pedagogical team. It is a laboratory of creation and incubator for projects. Career prospects : independent designer, designer working in the agribusiness sector or the world of cuisine, events creator, etc. The students simultaneously pursue many projects : projects that take place over a term, workshops, seminars, theoretical classes and immersion in a professional working environment. Academic, with the Equipe Alimentation, and the Unesco Chair in History and cultures of food of the Université François Rabelais de Tours. Practical, different Michelin starred restaurants and the Lycée Gustave Eiffel (Reims). The cultural and academic partners are involved in this course and offer artistic and cultural openings, and share the research with the public. It is primarily the Manège de Reims, Scène Nationale de la Comédie de Reims, Centre Dramatique National, the Escola Superior du Artes e Design – Caldas da Rainha (Portugal), the institut français of Bombay (India), the réseau des Alliances Françaises en Amérique Centrale. Facilities : The course has access to all the facilities of the ESAD. Students enrolled in the École Supérieure d’Art et Design de Reims are eligible for a scholarship bursary from the Ministère de la Culture et de la Communication on condition that they are younger than 28 years old on the 1st September of the academic year. The scholarship bursaries are given in accordance with 3 criteria : the income of the fiscal household, the number of children that are tax burdens and the distance from the place of study. A grant simulator can be used on the CNOUS and CROUS websites in order to be able to evaluate the possibilities of receiving a scholarship bursary based on social criteria. Be careful to make your requests for bursaries and/or accommodation well in advance as the file must be entered and completed on the website of your CROUS between January and April 2016 for the start of the academic year 2016/2017. The grid for scholarship bursaries based on social criteria has 9 levels. A progressive scale is fixed every year. This allows for bursaries going from exemption of paying for social security affiliation at level 0, to the payment over 10 months of an annual bursary scaled from approximately 1000€ for the level 0 bis and reaching more than 5000 € for level 7. Scholarship bursary holders are totally or partially exonerated from paying for trips organised by the establishment (transport and accommodation). ESAD students, bursary holders or non bursary holders, can request, either from the social assistance or the CROUS occasional grants : emergency financial aid, access to the subsidised grocery store, etc. These are awarded, under certain conditions relating to their resources, to students who have been residents in Reims for at least five years. Every year, the city of Reims rewards 300 € to a worthy student of the ESAD. The FNAUAC allows for the attribution of an annual urgent aid to students who are having long-term difficulties that are attested by the ESAD Director and the CROUS social services, but who are not eligible for a scholarship bursaries based on social criteria because they do not satisfy all the conditions that are imposed by the regulations. Grants for study stays and/or a professional internship abroad, can be paid in the framework of the European programme Erasmus+, by the Conseil Régional or the Franco-German Office for Youth (Office Franco-Allemand pour la Jeunesse- OFAJ). The students continue to receive their scholarship bursaries based on social criteria during their mobility, if they are temporarily admitted into an establishment situated in a member state of the European Council, which has ratified the European agreement of 12/12/1969, and subject to agreement by the ESAD. Prisme, the voluntary organisation of doctors from Reims, provides a prize every year of 5000€ to a young graduate from art. It is obligatory, since 1948, for every student aged from 16 to 28 years old to join a social security system. Registration in higher education establishments cannot be accepted unless the specified payment is made. The affiliation is recorded and paid for in the establishments which then transmits this to the payment centre. In Reims, students can choose between two payment centres : the LMDE or the MGEL. The affiliation is obligatory from the age of 16 years old, except in certain special cases. It is free for scholarship students as well as for students who are between 16 and 19 years old during the academic year. For students aged 20 and over during the academic year and not receiving a scholarship, the affiliation must be paid (215€ for the year 2015/16). Certain special cases, often linked to the parent’s profession, or in relation to the student’s type of employment can derogate these rules and result in a specific study by the students affairs service of the ESAD. Every student must have a civil liability insurance for any harm that could be caused to a third party, during his/her activities in the School as well as outside during his/ her pedagogical voyages in France or abroad. Each student signs his/her adherence to the internal rules in the first year in the establishment. The Ecole Supérieure d’Art et de Design is located in the city centre, near the Musée des Beaux-Arts, the Palais du Tau, the Médiathèque municipale and the Cathédrale Notre-Dame. The School is seven minutes from the train station, by pedestrian streets. The ESAD Cathédrale consists of a modern building built on three floors, dating from 1962, in a U-shape around a central courtyard, and of an annex, the salle Jadart, located on a neighbouring block. The administration, the main workshops and all design students (all options) can be found there. The annexe de Franchet d’Esperey, three tram stops from there (10 minutes) brings together in two buildings the spaces for the first years, the amateur activities classes, the students in the option art and the incubator for Art and Design. In a school period, the opening times of the establishment are 8 am to 8.30 pm from Monday to Thursday, and 8 am to 6 pm on Friday. ESAD does not manage student’s residences or university rooms. Students benefit from the CROUS services, an organism to which any requests for accommodation need to be addressed : CROUS de Reims – 34 boulevard Henry-Vasnier – 51100 Reims (online demand). Students on an exchange can get in touch with the BDE in order to set up a welcome network or an accommodation aid can be set up with students from the school. In the city of coronations, the past, the present and the future come together. From the four UNESCO world heritage sites to more modern buildings, with a detour via the Art déco heritage, Reims reveals an architectural heritage that is as impressive as it is alive. A twice millennial city, by turn a powerful city of the roman empire, the site of the coronations of the kings of France, the city chosen as the site of the French and German reconciliation and for European construction, Reims has been the theatre of some of the greatest events of the country. This glorious past every day feeds a great appetite for modernity. Audacious, Reims dares to have a glass mediatheque opposite its gothic jewel ; a tramway links its two TGV stations. Ideally situated at the crossroads of major motorway lines and served by the TGV Est Européen which puts it at 45 minutes from Paris and 30 minutes from Roissy, Reims gives a perfect chance for development and welcomes new inhabitants every year. Its intense cultural activity provides numerus partners from live performing arts, heritage and contemporary art for the ESAD : the Centre Dramatique National, the scène nationale, the Studio National de Création Musicale, the music scène, the Opéra, the FRAC etc. Several festivals intersperse the year : Elektricity, les Bisqueers roses, Reims Scènes d’Europe, Orbis Pictus and the Flâneries Musicales are the main ones. And last but not least, gastronomy has three Michelin starred restaurants : one, two, or three stars. Every student in 1st year is mentored by a student in 3rd or 5th year. The mentoring consists of, ultimately, building up a network and enriching it over the years. The mentor reassures their protégé/e by letting them know that they are available to meet them, advise them, and to help them to progress in their schooling. In exchange the protégé/e helps their mentor at the time of their examination for the DNAP or the DNSEP. The Bureau des Etudiants (the “BDE” or Student’s Office) is an association whose representative is elected every year. Take part in promoting the School and its production ;To develop outings and trips in agreement with the School’s direction. A subscription fee of 27 euros is asked of all students at the start of the year, at the same time as their enrolment in the School. This association takes care of activities specific to Food Design. The network of ex-students is currently being created. The work brings together a series of texts and interviews that cover the advances of deleuzienne thought from the 1970s to the 1990s. Twenty years of philosophical evolution, still in touch with its “outside”, addressing itself to philosophers and non- philosophers alike. If Deleuze wished to question the unity of language to bring forth new modalities of meaning – multiple and sometimes paradoxical – this work, immense in the perspectives and the fields that it uncovers, allows us to appreciate the multiplicities that are found in Deleuze’s words and images. Generally “pourparlers” (negotiations) are long drawn out affairs aiming for a consensus. Here, each text constitutes more of a possible movement to conduct a “guerrilla campaign” against oneself, against the certainties of what things are and how things speak about themselves. Pourparlers is more than just an introduction to deleuzienne thought, it is a war machine against all the foregone conclusions that encircle and frame the real and the language that is supposed to say it. Pourparlers (negotiations) between art(s) and philosophy to say thing otherwise. The contributors explain their link to the work : to what extent did it guide their work? What relation does their work have with this or that aspect of Deleuze’s thought? From the reading that each person makes of Pourparlers, it means thinking about the ways in which Deleuze develops, in plural forms, languages and images in the arts and in philosophy as much as in politics. Last published text during the lifetime of Merleau-Ponty, l’Oeil et l’Esprit condenses and deploys some of his main lines of thought from painting and the gesture of painting… This work sets itself this challenge : to show that this text is still relevant, in the aesthetic field and in contemporary artistic creation. This gives rise to the question that is addressed to both philosophers and artists : in what manner does the reading of l’Oeil et l’Esprit influence your work and your reflexion today? A sensitive path and the proceedings of the symposium “transtopia, industrial wastelands, which spaces” conducted by ESAD Reims with URCA and the Ecole d’architecture et du Paysage de Lille between 2008 and 2009. The proceedings of the International symposium “Cuisine and Design : the question of gestures, bodies and representation” organised for the first Rencontres Internationales de l’Art et du Design and hosted by Manège de Reims, in October 2010. This book is the fruit of diverse conferences, days of research and workshop production with the ambition of laying the foundations of a reflection that is deploying itself in the field of vegetal design. The proceedings of the International symposium “Poétique du Végétal en milieu urbain” of 6th November 2012, and the research of the ESAD in vegetal design are reunited in the book Faut Pas Pousser. This book is the fruit of diverse conferences, days of research and workshop production with the ambition of laying the foundations of a reflection that is deploying itself in the field of vegetal design. From the tree tops of the primary forests to the artist’s studio, via tobacco plantations or scientific laboratories, Faut pas pousser brings us to the core of these concerns that meet each other, brush up against one another or collide in the fertile land that begins with our imagination. After studying music and electroacoustic composition in the Musicology UFR in Reims, and then in the creation studio of Césaré, and completing his training in the IRCAM, Vivien Trelcat gives a lot of space in his compositions to accidents, artifacts, chance, while keeping a direct relation to gestures and bodies. Rumours, reflections and games of transparency are mixed into a sonic painting, in pieces influenced by repetitive music, improvised or extra European. A musical assistant in Césaré, he guides workshops on artistic practice in the school environment and with “second-chance” schools. In the ESAD, he teaches the use of sound. Véronique Maire is a designer. She began her career in the Andrée Putman agency where she was products development manager. 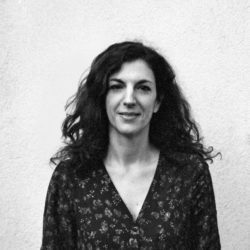 In 2001 she co- founded the agency IK design and began with her associate a reflection on the product design, interior design and scenography. They created one of a kind pieces that were exhibited in the best galleries, they collaborated with Packard Bell and Cartier. Today Véronique Maire has set up her own creative studio and is working in different collaborations. In the ESAD she is the Chairholder of IDIS and teaches design to 4th year. With a degree from the Ecole du Louvre and a doctorate in art history from the Université Paris-Sorbonne, Valentine Toutain-Quittelier is a specialist in artistic exchanges between France and Italy in the 18th century, as well as the Regency of Philippe d’Orleans. Her thesis, Regards en miroirs. Les relations artistiques entre la France et Venise, 1700-1730 (“Seeing in mirrors, Artistic relations between France and Venice, 1700-1730”) won the Prix Nicole in 2012, which was rewarded by the Comité Français d’Histoire de l’Art. She co-directed the acts Watteau with confluent des arts; Esthétiques de la grâce (Aesthetics of grace) (PUR, 2014) and Visible Lisible (Seeable Readable), confrontations et articulations du texte et de l’image (confrontations and arcticulations of text and image) (Nouveau Monde Éditions, 2007). Her current research is on the transfers of models in Europe, and the interactions between art and finance in the context of what was conferred art status and gained heritage status in the financial world in the 18th century. In the ESAD, she teaches the history of classical art. A graduate of Sciences-Po (Institute of Political Science) Paris and trained in urbanism, Sara Lubtchansky has worked for several years in the development of an international festival for gardens in Chaumont-sur-Moire. Convinced that the vegetal approach is both a tool for cultural outreach and a part of the city of tomorrow, she invites creators from all disciplines and in particular designers to take possession of this approach. A free- lance since 2008, she has developed a cultural management that is geared towards contemporary creation. In the ESAD, she is in charge of the development of partnerships with the vegetal design studio. Born in England and a graduate of Fine Arts of University of Middlesex in London (painting, Sonic Art), Sam continues his exploration of art and sound in different ways. Very active in the Reims music scene, he works within a large number of musical projects, and presents a program on Radio Primitive. Sam has also been an English teacher for the past 15 years for adults and teenagers. In the ESAD he teaches English to the undergraduates. Rozenn Canevet is a historian and art critic. With an academic education (Université Paris I Panthéon-Sorbonne, Université du Québec à Montréal, Canada et Université Paris 8 Vincennes-St-Denis), she has a Ph.D in aesthetics, sciences and technology of art. A lecturer since 2002 in University Paris 8, her research has been the object of several publications, conferences and symposia both in France and abroad. She collaborates regularly with the magazines Artpress and Zérodeux reviewing contemporary art and also works with foreign publications such as Parachute. At the ESAD, she teaches art history and supervises the theses of the DNSEP (Master’s level) in art. A graduate from the Fine Arts of Metz, the Monfort University of Leicester (United Kingdom) and the Ecole Nationale Supérieure de Création Iindustrielle ENSCI/Les Ateliers, Renaud Thiry is a furniture designer and product designer. His projects are manufactured and distributed by Cappellini, Roche Bobois, Ligne Roset, Frag… Laureate of three Appels Permanents of VIA, two research grants from the FIACRE, as well as a public command from the CNAP, Renaud Thiry shows his research work in different galleries and trade fairs (Paris, Milan, London…). He is often invited to cartes blanches (Promosedia, du Meuble de Paris, Designer’s Days). In the ESAD he teaches design. With a Diplôme Nationale d’Art Technique (National Degree in Technical Art), “Visual Artist of Built Environment” from the Beaux-Arts de Reims, Raoul Sbaïz lives and works in Reims. He is in charge of the building and real estate company CIP-Ads in which he mainly creates new building projects for living or for working but also renovation projects. He teaches technical drawing in the ESAD. Pierre-Yves Le Sonn, independent designer, is a graduate of ESAD Reims. He began by assisting DELO LINDO and now works with other designers. Simultaneously, he associated himself with the designer Jean-Charles Amey in the STUDIO AMEY & LE SONN. He also collaborates with Claire Baudrimont. In 2012, they won both the 1st prize of the Cinna, young creators competition and the prize of the city of Vallauris for the design section of the International Biennial of Contemporary Creation in Ceramics. In the ESAD he teaches design and modelling. A graduate of the Ecole d’Architecture de Paris-Villemin and the Ecole d’Architecture de Charenton, Patrick Nadeau develops projects at the intersection of architecture, design and gardens. After a fruitful collaboration with Christian Ghion until 1997, Patrick Nadeau opened his own practice and expanded his activity as a scenographer and a designer. He now works with Hermès, Kenzo, the city of Rennes and also the Jardin des Plantes in Paris. The work Végétal design – Patrick Nadeau, written by Thierry de Beaumont (co published with Alternatives Particule 14/ juin 2012) presents all of his work in the form of a critical essay and monograph. In the ESAD, Patrick Nadeau pilots the workshop of vegetal design. A graduate of the Ecole des Beaux-arts de Valence, with a bursary from the FIACRE 1992, resident artist in Salzbourg (Austria, 1996), with exhibitions in the Centre culturel de Beauvais (1997), in the gallery St-Séverin in Paris in 1998, Patrick Chapus has been teaching at the ESAD since 1982. His pedagogical experience and his interest for all forms of artistic creation are valuable assets for the teaching of drawing and painting. At the ESAD he has taught drawing since 1992. A graduate of the Ecole Nationale Supérieure des Arts Décoratifs in Paris, Olaf Avenati is a multimedia designer and graphic designer. Laureate of the International Mobius prize in 2000 (special prize of the jury) for the CD-Rom “In the Heart of Bahia”, he has been working in the studio of “Tout pour plaire” since 1998, creating objects for digital publishing and traditional paper based media, in the cultural, institutional, and associative domains : web sites, artist’s DVDs, CD-roms, interactive terminals, animations, books, posters, illustrations, brochures, visual identities, signage system and cultural walks. In the ESAD he is responsible for the program First and overseeing work on masters. Lives and works in Paris. Graduate from the Beaux Arts (Fine Art School) de Montpellier in 2005, Mark Geffriaud has shown his work in France and abroad: in the Palais de Tokyo (2008) in the Musée du Jeu de Paume (2011), in Plateau Frac Ile-de-France (2008, 2010-2013), in the Centre Pompidou (2014), in the galerry gb agency (2009, 2011, 2015), in Mamco, Geneva (2015), in the Artist Space, New York (2009), and in the David Robert Foundation, London (2009). In the ESAD he teaches students in the option Art. A photographer and a video artist, Manuela Marques was born in Portugal. She lives and works in Paris. She shows her work both in France and abroad : Galerie Anne Barrault (Paris, France), Galeria Vermelho (Sao Paulo – Brazil), Caroline Pagès Gallery (Lisbon, Portugal). She won the BesPhoto prize in 2011 and in 2013, the Residency Prize of the Fondation des Treilles. She has published several monographs such as “La taille de ce vent et un triangle dans l’eau” in 2014. At the ESAD, Manuela Marques teaches photography. See more at galerie Anne Barrault website. A graduate of Ecole Supérieure des Arts Appliqués Duperré and the Ecole Nationale Supérieure des Arts Décoratifs de Paris, Laurent Meszaros is a graphic designer with the agency wa75. He creates the graphic and visual identity of cultural products, working closely with the publications of the Laboratoire d’Aubervilliers. He also devised the signage system for the restaurant Georges in the Centre Pompidou, and made “Graphisme en France 2005” published by the Centre National des Arts Plastiques. At ESAD, he teaches graphics / multimedia. A designer, Laurent Greslin began his career through the discovery of material. After acquiring the diplôme des métiers d’art (graduate in arts and crafts) option woodworking, he worked for two years in a forge and discovered as a result metal and the arts of fire. In 2002, he graduated with a Masters in the ESAD in Reims. He returned once again to the flame to learn about the art of glass blowing with the ADAC in Paris. From 2003 to 2010, he was head of industrial design for the SEB group in the agency DELO LINDO. In September 2011, Laurent Greslin opened his own design studio in which he developed his activity around more personal concerns, questioning the concerns of his profession while at the same time articulating the facettes of his knowledge, from crafts to cutting edge industry. In the ESAD he coordinates the digital hub which he set up in 2005, and teaches design. In the agency LB2, Laurent Burte is a graphic designer. Apart from creating web sites and digital animations, he also works on many publishing and press projects, graphic charters, and creates events communications for diverse clients. Laurent Burte is the author of a manifesto on scratch music linked to his typographical research : “Scratch graphic”. In Reims, he teaches graphic design and typography to the undergraduate cycle. Laurence Mauderli is a historian and design theorist, a doctoral student in Arts and the Sciences of Art, with a Masters from the Royal College of Art of London. She has a penchant for the themes of design and its various contemporary and historical uses, and for material culture. She is the author of numerous publications and has collaborated with various museums : V&A Musuem in London, Museum für Gestaltung in Zürich, Centre Georges Pompidou in Paris as a scientific collaborator and as a curator in several exhibitions. In the ESAD she teaches history and the theory of design and oversees the theses in product design. To design, Julie Rothhahn begins by eating. Curious and a gourmand, she tastes everything in order to analyse the senses, open ways of thinking about it and to bring to food, a design, that helps to digest, to have fun and to escape. After graduating from the Ecole supérieure d’Art et Design de Reims, she was the laureate in 2009 of the “grand prix de la création de la ville de Paris” in the design section. She brings a designer’s view to food which becomes a material that can be modelled, staged, given a meaning. The food becomes as a result a sensitive, emotional, regressive, even transgressive thing. Her work as a designer manifests in different ways : collaboration with the food service industry, craftsmen, the agro- food industry, events organisations. In the ESAD she teaches food design. Interior designer and freelance designer since 2002, Jean-Paul Augry graduated from the Ecole Nationale des Beaux-arts in Lyon. He has worked, amongst others, in collaboration with Ruedi Baur, for the architectural biennale in Venice, created the showroom for the new Citroën headquarters and has worked on projects for the Science Museum/ Alexandria Library (Egypt) and also at the Museum of Jeu de Quilles. The Laureate of an AFAA grant, he spent 2 years in West Africa for the development of projects in design and manufacturing objects in collaboration with crafts people from West Africa. He created his own agency in 2009. In the ESAD he teaches design to the undergraduate level and accompanies the students up to the DNAP. After studies in the ENSAV de la Cambre in Brussels (section restoration of art works), Jean-Michel Hannecart continued an education in visual arts (section painting) in the Institut St-Luc/ERG. He regularly exhibits his painting in France and abroad. His works are in French public collections as well as numerous private collections both in France and abroad. In the ESAD Reims, he teaches drawing. An American artist, based in Paris. His work is plural : painting, drawing, film, photography, music and installations, are all different mediums for this artist who graduated from Hunter College, the City University of New York in 1996. He exhibits in France and in the United States. In the ESAD he teaches painting in the English language. Born in Brindisi in Italy, Giuseppe Gabellone lives and works in Paris. A graduate of Artistic High School diploma – Liceo Artistico, Brindisi in 1992, and subsequently of the Academy of Fine Arts, Bologne where he spent 2 years, he finished his education in 1995 in Academy of fine Arts, Milan – Accademia di Brera. Numerous exhibitions have marked his career : Galerie Perrotin, Paris (2011), Domaine de Kerguéhennec, Bignan (2008), Museum of Contemporary Art, Chicago (2002), Fondazione Sandretto Re Rebaudengo per l’Arte, Turin (2000), alongside prestigious group shows such as Palazzo Grassi, Venice and Museum of Contemporary Art, Chicago (2008), Venice Biennale (2003), the Biennale de Lyon (2003), and Documenta 11, Kassel (2002). At the ESAD, he coordinates the Masters in Art. After five years spent working with the designer Jean-Marie Massaud, Germain Bourré has developed his own path at the meeting of the universe of vegetal design and food design around the creation of furniture and objects. In 2005 he set up his agency in Paris and developed the multi- disciplinary approach of his work. With his background in food design, Germain Bourré values a sensitive and global approach. Bringing together his skills in object design and design of space, he works on food and its special features just as much as the staging of the actual food. He works in collaboration with great chefs (Arnaud Lallemant, Pierre Hermé, Philippe Etchebest, Jean-Pierre Vigato or also Mathieu Viannay…) and regularly exhibits in France and abroad. In the ESAD he is in charge of the Master in Food Design. Gérard Cairaschi, multimedia artist, video artist, photographer and installation artist, lives and works in Paris. His works questions the cultural dimensions of the image, its codes and its strategies, its historical weight and references. Gérard Cairaschi received in 2005 the Special Prize of the jury of the Videlogia Festival (Russia), the CANAL+ prize for video creation at the International Festival of Short Films of Clermont-Ferrand of 2004, the Special Prize of the jury of the Videolisboa International Festival (Portugal, 2000) and the Prize for creation in video of the S.C.A.M (Société Civile des Auteurs Multimédia) in 1999. In Reims he teaches video. From Belgium, Fabrice Bourlez has a PhD in philosophy (Université de Lille 3 and the Univeristà di Pisa) and is a also a psychoanalyst. His thesis was about the cinematographic work of Pasolini. He is the author of different articles on the cinema, psychoanalysis and questions of “genre”. His favourite authors are Deleuze and Lacan. He also works as a translator (French/ Italian) of philosophical texts. As well as his work as a researcher and teacher, he takes care of patients in the Rouen hospital. In the ESAD, he teaches philosophy and overlooks the thesis of 5th year students. He is also co-director of the collection “Art and Philosophy” (co-edition ESAD – URCA). Fabien Cagani is a designer and interior designer who graduated from the Ecole Nationale Supérieure des Arts Décoratifs de Paris. He is the cofounder, with Laurent Matras in 1985, of the group Delo Lindo (Paris), the unique signature of all their projects. Delo Lindo collaborates with Soca, Ligne Roset-Cinna, Grosfillex to manufacture furniture. At the moment, the duo are working on the conception of a small range of electrical ware for the Seb group. Fabien Cagani teaches product design and accompanies the 5th year up to their DNSEP degree. Designer, with a degree from the ESAD in Reims in 2002. He worked with Matt Sindall and Mathilde Bretillot in their agency from 2002 to 2009. The laureate of the Bourse Agora 2007 with the collective Dito, of which he has been a member since 2006. Designer and independent since 2009, he is working today on furniture, object design and scenography. In the ESAD he teaches Design Product. Doctor of Aesthetics, Science and Technology of Arts from University Paris 8, Saint Denis, Emeline Eudes works both as a researcher, in the domain of environmental aesthetic, and in the field of visual arts and design. As a result of this she undertook the pedagogical coordination of the Beaux Arts de Paris of the post graduate programme “Artist Educator in School setting”. Her activity as an associate researcher with Ladyss-CNRS (Laboratory of Social Dynamics and Recomposition of Spaces) tries to understand the diverse types of creativity that are found in urban milieu. Another aspect of her work is to spread knowledge of nordic and baltic arts through her publication ARTnord of which she is chief editor. In the ESAD, she is Head of Research. Daniel Meszaros is an architect, a graduate of the Ecole d’Architecture Paris-Villemin. In 2006, he founded Projectiles, a multi disciplinary workshop in architecture and scenography, which was laureate of the Nouveaux Albums des Jeunes Architectes in 2006. The projects in progress are a witness to the diversity of the sizes and the complementarity of themes that are covered : Musée d’archéologie in Lodève (2011-2015) ; Galerie de l’Histoire du Château de Versailles (2010-2011) ; Welcome halting sites for travellers in Paris (2009-2012) ; social housing in Paris (2009-2013) ; Wooden office in Epône (2009-2011) ; Dogon exhibition in musée du Quai Branly (2010-2011)… In the ESAD he teaches architecture and space. After a first schooling in the Beaux-Arts de Rueil-Malmaison, Cécile Meuleau followed a course where she specialised in textile design in ENSCI (Ecole Nationale Supérieure de Création Industrielle) in Paris. Beginning as a colourist for Gérard Darel’s creative studio, she joined the design studio of Tai Ping Carpets, creators of hand woven carpets. An independent textile designer, she regularly works with architectural firms (Culture in Architecture, Stylagos) and carpet and tapestry manufacturers (Pinton, Robert Four) in motif creation, colour and material development. In ESAD she teaches “colour and material”. Cécile Le Talec is a graduate of the University Paris-I Panthéon-Sorbonne. She lives and works in the Centre Region of France. She has developed over many years an artistic approach around issues concerned with the perception of space in its sonic dimension : linguistic and musical. She regularly works with composers as part of projects of concerts/ performances (Nicolas Frize, Leilei Tian, Alexandros Markeas). She regularly shows her work in different FRACs (regional art centres) and galleries such as the School gallery Olivier Castaing, as well as in Mexico. In the ESAD, she teaches Volume / Space. After a university education in audio visual and information- communication, he developed a practice as a graphic designer. He became interested in the narrative potential that graphic forms can convey, especially in the question of editing. His production links intertextuality and the principle of adaptation, in relation to the methods of communication that come from cinematic language. He explores the relations that graphic design has to other artistic practices. 2008 : Creation with Catherine Guiral of the studio officeabc (2015 ico-D Excellence Award) 2011 : Creation with Jérôme Dupeyrat and Catherine Guiral of the Agence du Doute (exhibition curator in 2013 in Pompidou Centre; co-direction of the work L’Écartelage ou l’écriture de l’espace d’après Pierre Faucheux) 2013 : Founded, with Thierry Chancogne et Catherine Guiral, on line magazine Tombolo. At the ESAD, he teaches graphic design to the undergraduate cycle. Audrey Tenaillon est scénographe etAudrey Tenaillon is a scenographer and interior designer who graduated from Ecole Camondo. She was responsible for the scenography of Swiss Confederation Pavillion in Morat, the Ecomuseum in the Pays de la Cerise in Fougerolles. Audrey Tenaillon received the Prize for Innovation and Communication, for her exhibition project “Petrol, new challenges” in 2004, in the Cité des Sciences et de l’Industrie in Paris. In Reims, she teaches design of space / scenography architecte d’intérieur diplômée de l’Ecole Camondo. Elle a signé notamment la scénographie du Pavillon de la Confédération Suisse à Morat, de l’Ecomusée du Pays de la Cerise à Fougerolles. Audrey Tenaillon a reçu le Prix de l’innovation et de la Communication, pour son projet d’exposition « Pétrole, nouveaux défis » en 2004, à la Cité des Sciences et de l’Industrie de Paris. A Reims, elle enseigne le design d’espace / scénographie. Graduated of the ESAD Reims Master Product Design after a technical diploma in industrial design, Arnaud Cozeret, founded the “Studio Noncommun” with Pierre Loustaud in 2014.Specialized in products design and interior architectures, they focus on the new experiments of the users. In the same time, Arnaud Cozeret is a member of OnOff Crew, an artists association that creates installations and fresques for galleries or Institutions. At the ESAD Reims, he is teaching 3D modelization and digital prototyping. A graduate of the Ecole Boulle in 1993, Anne Fressard is an interior designer. She has been responsible for the conception and overseeing projects for stands, scenography and TV sets. In interior design, the different scope for applications are as diverse as housing, hotel industry, retail sector, bars/ restaurants and champagne houses. In the ESAD she teaches technical drawing, a rite of passage for designers and for contemporary artists. After studying graphic design in the ESEIG in Portugal, Sonia De Rocha moved to Paris to study with Claude Mediavilla ; this encounter resulted in the creation of MediaType Foundry in 2010. The same year she studied a post graduate course “typography & language” in the Ecole Superieure d’Art et de Design of Amiens during which she developed a character using Latin and Arabic. She then joined the team of Jean François Porchez ( Typofonderie and Zecraft ). Since 2013 she has been working independently as a graphic designer and typographical designer. In the school Sonia De Rocha teaches graphic design. From Dublin, in Ireland, Macdara Smith lives and works in Paris. He graduated with a Masters in Visual Arts from Ecole Nationale d’Arts Paris Cergy in 1998, and since then has created in the domain of music and performance art. He plays in several projects as a trumpeter or singer (Osteti, Zarboth, Electromenager, Think Twice, 11:11). One of his projects, 11:11 is in residency in Mains d’Œuvres in Saint Ouen. In Europe he has played in many venues and has brought out several albums and vinyl 12”. Working in different mediums, mixing writing, drawing, music and performance, he is interested in the spectacle of life. He also draws fanzines and designs album covers. He teaches English in Université Paris 8, ENSAPC and in La Défense. In the ESAD, Macdara Smith teaches English. With a degree from the ESAD of Reims and a Masters in Art Research from Paris Sorbonne, specialty: Spaces, places, exhibitions, networks, Jean Wanschoor is a visual artist from Reims who diversifies his sectors of activity by also working as a photographer, graphic designer and a model maker for several businesses from the region such as La Boîte à lumières and Publ’image studio. He is also the founder of an artistic association La Clique, in the nearby town of Bétheny, and co founder of La Spirale, a brand and a textile screen printing studio. At the ESAD, Jean Wanschoor works as a teaching assistant (photography, video, screen printing, production and digital post- production). Mathieu Ehrsam is a multimedia designer. After a scientific education, and then a BTS (technical diploma) in industrial design in La Martinière in Lyon, he graduated from the ESAD in Reims. He founded the studio “Les Diverstructeurs” within which he has diversified his field of action and developed close collaborations : with the designers “Agent M”, the gallery Xippas (Paris), the graphic creation studio “Tamanta Famiglia”, the communication agency “Brief&Nous” and the event studio “FlyAway”. He has created numerous websites for artists and designers as well as illustrations and animations. He has been simultaneously working on a research project bringing together biological and digital experiences. In the ESAD, he teaches digital design. Appel à contribution pour la journée d'étude, le 29 mars 2016 à Reims, co-organisée par le Centre Interdisciplinaire de Recherches sur les Langues Et la Pensée (Université de Reims Champagne-Ardenne) et l’École Supérieure d’Art et de Design de Reims. Les propositions (1500 signes, espace compris) comporteront un titre et un résumé. Elles seront accompagnées d’une brève bio-bibliographie de l’auteur (600 signes maximum). Réponse aux auteurs : 29 janvier 2016. Rendez-vous incontournable de l’ESAD, les journées portes ouvertes sont l’occasion pour les futurs candidats ainsi que pour les passionnés d’art et de design, de découvrir les locaux, équipements, et les travaux réalisés par les étudiants. Les enseignants, le personnel administratif et les étudiants seront à votre disposition durant ces deux journées. Cécile Le Talec est diplômée de l’Université Paris-I Panthéon-Sorbonne. Elle vit et travaille en Région Centre. Elle développe depuis de nombreuses années une démarche artistique autour de questions relatives à la perception de l’espace dans sa dimension sonore : linguistique et musicale. Elle collabore régulièrement avec des compositeurs dans le cadre de projet de concerts/performances (Nicolas Frize, Leilei Tian, Alexandros Markeas). Elle expose régulièrement au sein de différents FRAC et galeries dont la School gallery Olivier Castaing, ainsi qu’au Mexique. À l’ESAD, elle enseigne le Volume / Espace. This project, inspired by the practice of customization, allows you to transform your vehicle with different modules for driving, merchandise transport or people transport. An independent chassis, with modular wheelbase, can receive different modules, to create the perfect vehicle for your current needs. Hence, you can drive with a single cockpit, with a camper module, with a food truck, or with other variations. The concept always exploits the base of the same vehicle. Projects achieved in partnership with the company CAMPA, a luxury electric radiator manufacturer. At first the students visited the factory and were familiarized with the technologies and modes of assembly of the radiators. They then devised proposals addressing the mobility issues, and aspects of its use and / or quality perceived by the user. The company has selected three projects to produce a prototype. The radiator has a «crumpled» looking surface and changes color with the heat: temperature is then evaluated at a glance. The object is no longer hidden, but actively contributes to the decor and home life due its’ advanced and changing graphics. The decorative appearance of the radiator using a variety of superimposed materials, like paintings in a portfolio. The radiator can be laid against or hung on the wall. A simple handle is integrated for this purpose. Power is supplied by the base on the wall or at floor level. The idea of the project is to make the radiator more versatile, by separating the component parts it becomes more adaptable and durable. The electrical resistance and the control box, more fragile, are separated from the main body which has better longevity. The electrical resistance is contained within an aluminum casing and permits a variation of the possible materials for the heat diffusing surface. Thus, on the same basis, it is possible to generate radiators of varying shapes and radiant intensity. Five objects (obsidian, corner, beam, fireplace, fireplace set) with a common heating function and a minimalist, geometric, black and lacquered look interact with the space and architecture, and can be used either together or separately. The French Tannery Federation launched a competition between five schools of Design, selected in France, for the students to invent new ideas for the use of leather, other than the usual and conventional ways. In this way widening the field of application and encourage ingenuity and innovation in the use of the material as a structural element be it decorative and / or architectural. A team from the ESAD of Reims won the first prize of € 5,000. Winners 1st Prize: Elodie Elsenberger et Fabien Szczepanowski “Arteria” The light fitting consists of a network of flexible or rigid leather strips on a metal core, crisscrossed by an array of LEDs, creating diffused light. (190x100cm). This stool explores the structural properties of leather. The seat is made by the twisting of the material ad while maintaining the usual manner leather is used to cover a surface. Little, fine and frail are words suggesting the uncertain state of fragility. We do not know its strength; we doubt its ability to bend without breaking. Fragility implies possible breakage, a temptation for demolition; fragility navigates between endurance and fracture. For Soft Ground, this notion of fragility and precarious state crystallized around a single foodstuff: the meringue. Research into the limitations and creation of volume in the use of this foodstuff is the focal point of this form of art, meringue in its usual decorative form is transformed into various emaciated, lightweight, ephemeral works of art. But if it does break up it gives its place up to a different foodstuff providing taste as vivid as the demolition is sudden because this fragile state is not doomed to remain stable or constant. The stress involved created all the delight of this experience. Luc Beaussart, Audrey Charré and Clémentine Schmitt Special Jury Award. The project was developed as part of the ESAD Reims “Semaine Folle” 2011 with the help of Jon Marin, a lecturer in multidisciplinary biomimetism and ecodesign projects at the Sabadell College of Design in Spain Urban Greenhouses aims to promote plants that naturally occur in undesirable places. The “weeds” we find in our cities are actually useful, life-affirming and sometimes even edible. The first goal of this project is therefore to promote them by the kind of signage one would find in a greenhouse so that they can flourish, grow and earn the respect of local residents and passers-by. The second advantage of the project is that it uses the plants that have been highlighted to make compost; by adding glucose syrup to the organic waste, it is transformed into a fertile solid substance. It can then be easily used for indoor plants by cutting it into cubes, which are a reminder of its protective role and also look like sugar cubes. This project’s strongpoint is that its invites us to reconsider the natural world we find in our cities and to put it to good use as a means of creating an urban lifecycle. For many years now the Maison de la Culture of Amiens houses the «art, city & landscape» festival in the Hortillonnages of Amiens, a former marshland transformed into floating gardens in the Middle Ages, now an important market gardening area. It used to be called «vegetable Venice». Today these 300 acres of marshland, where water covers a hundred hectares, lies from the heart of the city, but only seven professional gardeners working 25 hectares make a living from it and sell their produce to the markets and supermarkets. With this Festival, artists (landscape architects, architects, designers and other students of these disciplines) are offered plots of wasteland to create temporary or permanent set-ups for the public to visit on foot or by boat. Students, after visiting the 2011 edition of the Hortillonnages, formed small groups in order to investigate the possibilities of integrating the natural and touristic dimensions of this area of natural heritage and adapt it to the general public. Vegetal book – Madeleine Todd Morel A life-size herbarium, a life size living dictionary for the discovery of the principal species of local vegetation. Disintegration – Thomas Kern et Marie Legentil The project focuses on the problem of the gradual disappearance of the islands and questions the existence of the possibility of an imaginary other side to the now abandoned gardens. Save the floating gardens – Bérénice Garnier Huge photographs have been installed over these abandoned plots as a testimony to the heritage before it is deteriorated by the passing of time. Students were invited to explore the issue from their point of view as designers , placing themselves at the level of interaction between man and his environment. In 2013 Students of ESAD of Reims concentrated on urban agriculture placing it in the context of the City of Reims and in the Reims 2020 project. Led by Patrick Nadeau, architect, designer and founder of the Plant design workshop, Sara Lubtchansky, town planner, and Nicolas Bonnenfant, landscape architect within the organization COLOCO, they were invited to explore the issue from their point of view as designers , placing themselves at the level of interaction between man and his environment. Projects as diverse as nursery gardens, ways to promote local production, the creation of networks between consumers and producers … have been devised. Often with an educational approach, several projects have sought to develop a methodical and temporal vision of the agricultural productivity cycle. Five projects were brought together having in common the desire to go beyond the purely market garden approach, by using practices from the past or from elsewhere in the world, to show that agriculture is an activity that can contribute to the development of trade and re-organize industrial production cycles. Originally designed to be independent they prove to be complementary and interdependent. Bio-gas – Élodie Elsenberger, Marion Galisson Methane is also a product of rotting compost. Compost mixed with air makes humus which feeds the soil and produces heat. Mixed with hot water, it ferments and produces methane. This bio energy feeds the stove to cooks the vegetables. In Japan and Cambodia, cabins are heated with compost; in Rwanda and Benin, methane is used for cooking, while in Sweden, bio gas is produced industrially to heat houses and run cars. Stills – Salassa Mitsui If fruit trees grew in the city … the city would be a village! So as not to throw out rotten fruit from our urban orchards and supermarkets, we could distill them and make fruit brandy or a small amount of alcohol to run an engine. Fire produces ashes to make bricks, creates heat or cooks a snack and creates a social well-being, allowing some time to think. What if the city adopted the rural traditions ? With the city of tomorrow in mind, ESAD imagined to equip buildings in its city centers with vertical biotopes, real signs of biodiversity in urban areas. This vertical garden called upon the design work of the Schools students and the latest planting techniques. This living work of art is designed as a perfect example of vertical gardening, and includes undemanding plants coexisting with birds and insects and requires very little maintenance. Hives installed on the roof of the school in 2009 are fully integrated in this ecosystem that may obtain an official label as a LPO refuge. Just as in nature, insects allow plants to reproduce, while the flora provides food and refuge to small wildlife. It is in this balance of the living and its integration in the city that demonstrates the various skills of the ESAD. Students were asked to develop the project and imagine birdhouses, insect hotels and pots for plants. This successful project running since May 2012 is a mixture of wall plant boxes and various objects designed by students which are suspended by a system of hooks representing branches. These objects have been developed and prototypes created out of organic concrete by the expertise of the Companions of duty, the LPO (Bird Protection League) and experts of insects in urban areas. It is an opportunity to experiment with new techniques in natural materials. Project designed and developed by students: Élodie Elsenberger, Bérénice Garnier, Salassa Mitsui and Lauriane Vauthier. With the help of Clément Bernard and Thomas Kern. Many partners combine students’ creativity and companies’ innovation to enhance local expertise. Technical partners: Edivert (Ormes), Arden végétal, Le Bâtiment Associé (Muizon), La Maison de Reims des Compagnons du devoir, the Bird Protection League of Champagne -Ardenne , Maison de la Nature in Paris, CELC -Master of linen , Sineugraff. The Rollinger foundry asked a group of ESAD design students under the guidance of the designer Véronique Maire to take a fresh look at the world of ironmongery and notably window catches. A full-immersion session at the company allowed students to understand its semi-artisanal production process and to develop a response to the issues facing both the business and society as a whole. The objects currently in production are new additions to the foundry’s traditional repertoire and they mark the first stage in a long-term collaboration between ESAD and small companies and craftsmen practising traditional methods in the Ardennes. Jelly Belly Candy: substance, colour, flavour …. enhanced or modified by students of food design.The results were successfully exhibited in October 2012 at the Publicis Drugstore on the Champs Elysees (Paris). For the fifth edition of Food Design at the SIAL Food Show, students from ESAD Reims drew on their vision as budding artists to think up prototypes for products on the theme of “Home Chef”. XTC World Innovation consultants have identified an underlying trend that home cooking is influenced by celebrity chefs, the new gurus, and ESAD students were inspired to consider the relationship between the general public, food and cookery. 3-7 March 2012, Europain Show, Paris. The ESAD Reims students who took the food design option approached the theme of “Our Daily Bread” as part of a design project that combined contextual analysis, experiments, relevance and coherence. The research took place between October 2011 and January 2012 having been initiated by a visit from the company Eurogerm and followed up with their food design professors Marc Brétillot and Frédérique Bastien assisted by ESAD’s chef, Georges Ribeiro. Reinventing Our Daily Bread is an extremely wide-ranging subject area that covers every culture and discipline. Pride of place goes to the many diverse student projects. They examine how bread is produced, distributed, consumed and recycled. Time is a particular focus, some students delving into mythology while others look forward to new models of consumption to come. There is a dialogue between conceptual, palpable, ideological and practical points of view; they express movements and tastes, they discuss uses and techniques. 22-24 January 2012, Paris, La Mutualité. “Paris des Chefs” is a show that builds bridges between cookery and various other creative disciplines by teaming major French and international chefs with architects, designers and fashion designers to show what they can learn from each other. ESAD had two food design activities on show: firstly on one of the stands helping with the demonstrations, and secondly through its food design proposals for the closing dinner organised by postgraduate students and the Ecole Grégoire Ferrandi around the theme of Food Explorer. Manufacto is a cocktail that was dreamt up and prepared by students from the two colleges. They met several times to discuss their different approaches and decide on a subject relevant to both: the hand. Plant design is on the borderline between biomimetism, urban ecology and the decorative arts and has been part of the curriculum at ESAD Reims for the last five years or more. It is part of a new approach to home design. Observing and examining plants, their form, their structure, their geometry, their colour and their relationship with their surroundings helps designers to offer special, tailor-made and innovative solutions to current social, economic and environmental problems. This work on the scale of humans and plants complements the approaches of architects and landscape architects working at the scale of a city or landscape. This research project was led by Patrick Nadeau, Sara Lubtchansky and Patricia Ribault and involved first-year Master’s students in 2011/12. The first results went on show at the Jardin des Tuileries from 31 May to 3 June 2012 as part of the “Jardins, Jardin” exhibition. The projects were also included in a science and culture exhibition with INRA and Accustica as part of the 3rd International Art and Design symposium co-organised by ESAD and the Comédie de Reims in November 2012 on the theme of plants. For this workshop supervised by designer and ESAD teacher Renaud Thiry, and coordinated by Patricia Ribault, students put forward propositions based on preliminary research and those who were selected went to Venice to make their prototypes, where they were advised by glass designer and decorator Norberto Moretti, and by Dario Stellon who runs the SALVIATI workshop. Publication: Les 400 goûts, Design Cuisine et Geste. Marc Brétillot (designer), Philippe Chatelain (sound artist), and Eric Trochon (cook) created a participatory food performance on the theme of ‘Cooking and Gestures’ for 120 spectators and diners with their free take in a soupe au pistou. Performance coproduced by Le Manège de Reims, Scène Nationale and the Reims ESAD. The exhibition was part of the Quick Lab project, a collaborative partnership between the Quick Group and ten architecture and design colleges in France and Belgium, coordinated by VIA (Promotion of innovation in furniture). Students from the ESAD food design workshop took part and imagined scenarios with innovative forms and flavours for the hamburger of the future. (cf: catalogue of the exhibition held in Paris and Brussels in 2011). “As a designer I am interested in organoleptic sensations and how a product interacts to stimulate sensory receptors. To take this idea further it is first necessary to study the sensory impact when the food is placed in the mouth. “My research is based at the intersection of two disciplines, cookery and contemporary dance. I see the culinary gesture as a choreographic fresco. Culinary gestures draw the eye and delimit space. The volume thus created is constantly redrawn. The shapes and lines vary and stimulate the imagination. The culinary gesture appears and disappears. It cannot be pinned down and stimulates our attention. It acts in the present in accordance with a logic of action. The smells, colours, foods, and soundscapes (utensils and conversations) accompany and provide a framework to the sequence of specific gestures involved in making a dish. All these gestures taken together form a network of exchanges, circuits, and affects within a system of interactions. In partnership with the European Confederation of Flax and Hemp - Masters of Linen. This research project relates to new sorts of indoor objects made using plant material. The strength of the project comes firstly from the materials used – European flax and hemp (plant material that can be processed in multiple ways) taken from the plant world. It also comes from the references the dozen or so students working on the project drew on in designing their objects, taking their inspiration from the landscape (contours, relief, erosion, vegetation, and so on), as well as from their original development of these themes, combining composite materials and textiles made entirely of flax and hemp. In 2008/2009, food design students began work on the topic alongside the Transtopia research project. Given the extent and richness of the theme, this will be carried over to 2010, with the backing of external expertise and partnerships. The concept of landscape comprises 2 notions: – One offering a global, panoramic vision (stand-back). A vision that takes in everything, making it possible, on analysis, for whole assemblies to be defined, then sub-assemblies and so on, from macro to micro. – The other proposing a point of view, spatial of course, but by extension an ideological and cultural point of view. What can we see, what do we want to see? Naturally, the notion of landscape is broader than the stereotyped image of the beautiful bucolic landscape that decorates cake boxes or cross-stitch tapestries hung over the fireplace, little wooden chalet set against a verdant mountain backdrop, naïve landscapes… There are urban, industrial, sound, olfactory and food landscapes… Products lining supermarket shelves constitute a landscape, the sight of an open-air market, another food typology; it’s up to the designer to decide to create his/her point of view, to propose. The notion of landscape englobes all scales, crop landscape, production landscape, transformation, distribution, table or plate landscape. Difficult not to cite the “haute couture” experience of chef Michel Bras who creates the landscapes of Aubrac in his plates, not in any anecdotal way, but through a look that is at one and the same time distant and sensitive: for example a dish called “Shadow and light” (tuna and tapenade). There are many fields where landscapes and food are one, where landscape is changed by man to meet his nutritional needs. The next time you’re on a train between two stops, look out the window at the vast nourishing roll-out, the fields for livestock, workers’ allotments, vine slopes, ripe wheat, sugar beet. Further afield, banana plantations, rice paddies, soil-free greenhouse tomatoes, fish farms in the sea and oyster pots… a large part of what surrounds us is sculpted by the need to produce food. Current ecological and sustainable development challenges will certainly change these landscapes, just as previous challenges once designed them. The notion of landscape is not far removed from that of local land or terroir. Those who eat will be increasingly intrigued to know about and understand what they are eating. In the product itself, on its packaging, in the way it is distributed and proposed to consumers, the landscape will be increasingly present in various forms, as witness the number of recent advertising campaigns using it to enhance communication clout.. There is not a presentation in my activity of food designer where I do not begin by quoting the superb text of Francis Ponge “Bread”, where bread crust is compared to the Andes Cordillera. Is there any finer illustration of how far removed from matter we can be which will propose an interpretation that is right on the nail, sensitive and holds out promise of fertile imagination? Is it not the challenge that the designer has to meet to understand a global problem with as much stand-back as possible, the least amount of preconditioned reflexes and the minimum of preconceived ideas, and, fuelled by this analysis, propose a precise and singular project which perfectly expresses the whole? In order to celebrate the 20th anniversary of the "Beef Breeds of France" gastronomical competition, the bovine profession asked culinary design students, under the watchful eye of Marc Brétillot, to carry out work on the beef breed sector in line with a simple request: "Design me a beef breed". “As already demanding consumers and future players in this world that is changing at an increasingly fast pace, students have a valuable point of view. Small, expressive “brushstrokes” give us a picture of young people’s dreams, concerns and directions on the threshold of active life. Each with his or her own sensitivity and food culture works out a particular approach. The diversity of breeds echoes well for the future.” Marc Brétillot. The food design workshop run by Marc Brétillot, a major figure in that field, worked with the dairy products and delicatessen during the first semester 2008. Each student carried out his/her research with his/her own personal world, his/her attention to food science, aesthetics, poetic and social considerations. The projects have been then developed in taste terms and “cooked” by the rule book by Eric Trochon’s students at the Ecole Supérieure de Cuisine Française – Ferrandi (Paris). About twenty projects are exhibited at the SIAL (Paris Food Industry Show), the biggest show for food industries in the world. Some projects can be tasted in the kitchen of the Show. The works and research are published in the bilingual catalogue “Food design: Dairy products” and “Food design: Dairy products” co-edited by La Sauce and available at ESAD’s secretariat (price: 10 euros with the catalogue “Delicatessen”). Three gardens conceived by ESAD's students have been selected by the 2007 Chaumont-sur-Loire Garden Festival. This international event which attracts 180,000 visitors each year has presented 26 new gardens on the theme “mobile garden” in 2007. The jury, chaired by Erik Orsenna, has retained three works of students of the ESAD of Reims among the 77 projects made by the other schools. The three projects were conceived during the course of “vegetal design” led by designer Patrick Nadeau. The gardens have been achieved with the joint efforts of the pupils of Lycée de Thillois and the green spaces department of the City of Reims. The ephemeral garden of Reims' Former Jesuit College brings together a selection of four in situ projects: taking their inspiration from the historical function of the premises, the architecture or simply the existing plant life. They were on show from June to December 2007. “Educational Garden” by Charles Baudoin, Germain Cagnac, François Hédin and Estelle Mercier. Based on a botanical list of plants, from noble specimens to the humblest weeds, that have grown in this courtyard, the project provides a lesson in botany. Explanatory items classify and give a framework to in vivo specimens. “Spiritual Elevation” by Aurélien Mirofle and Seung Yong Song. The garden’s verticality draws inspiration from the former function of the premises. “Plant Growth” by Ulysse Neau and Pauline Regalia provides a structured expression and sound track. “Architecture in situ” by Julien Renault uses minimalist artistic elements and the site’s architectural backdrop to provide a sculptural setting with flower boxes. Research programme around the theme of gastronomy, proposed to the students of 4th and 5th years. The theme deals with ideas of pleasure in relation to sensory, technical and cultural specificities. The work is divided into four thematics: Preparation, conservation, table service, multimedia and gestronomie. These works have been shown at the Saint-Etienne International Design Biennial in 2006. The partners are: Les Crayères, Dyson France, Activ Concept, Fanfoart, Restaurant dans le Noir, Mauviel, Villedieu les poêles, Philippe Cauquil, Théma Design, Dupont-Corian®, Thierry Marx, Delcam France, Césaré, l’Astrance, IEHA, Délicabar, galerie Fraich’ Attitude. The food design workshop run by Marc Brétillot, a major figure in that field, worked with the fruits and vegetables in 2005-2006. Each student carried out his/her research with his/her own personal world, his/her attention to food science, aesthetics, poetic and social considerations. The projects have been then developed in taste terms and “cooked” by the rule book by Eric Trochon’s students at Ecole de Haute Cuisine Grégoire-Ferrandi (Paris). About fifteen projects have been exhibited at the SIAL (Paris Food Industry Show), the biggest show for food industries in the world. Some projects could be tasted in the kitchen of the Show. The works and research were a success and are published in the bilingual catalogue “Food design: The workshop”, available on demand at ESAD’s secretariat.